Belarusian Liberal Democratic Party and the Alliance for Peace and Freedom, is preparing a congress of patriotic parties – Forza Nuova U.S.A. The press office of the Liberal Democratic Party of Belarus (LDP) has announced yesterday the issues relating to the preparation and conduct of a congress of patriotic parties, which were discussed on April 5 last year in Minsk, during a meeting between his first Vice-President, Oleg Haidukevich, and the president of the Alliance for Peace and Freedom (APF) Roberto Fiore. During the meeting, which was also attended by Normunds Grostins, President of the Latvian party “Action” (Rīcības partijas) and Slawomir Ozhdyk, Polish security expert, it was agreed to provide for the holding of the congress in the capital, Minsk, after the Belarusian parliamentary elections. 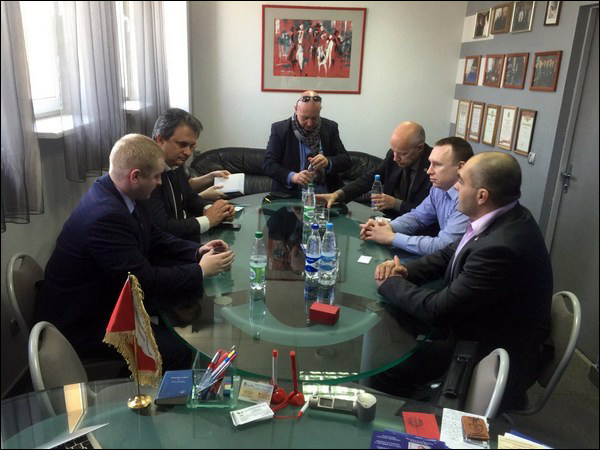 “it was decided also to strengthen relations between Europe and Belarus to strengthen political and economic ties and develop projects joint investment in the Republic of Belarus and – the statement of the press office of the LDP – favorable orientation to the use of APF representatives, as observers, to monitor the upcoming parliamentary elections.